Recent development in the field of neurobiological sciences have provided increasing awareness on the value of art on health of the person and ideas on mutual establishment of culture, mind and brain. Parallel it has matured, in terms of policy research and practice, the need of a participatory approach that places the individual and the community “can realize their rights to the highest attainable standard of health and wellbeing.” Participation, promoted in a global dialogue, it becomes elective element for a transformation of society. The aim of the article is to establish a basis for a continuous survey on the subject and to generate further interest in research on engagement with arts and health. The art and health nexus has always existed, from art as a representation of healthy and sick body to art as a therapeutic tool, to accommodate an ecological conception of human-environment dynamics and becoming “context” in hospitals and healthcare facilities. In recent decades it has received more attention and art began to be the action of changes which follows the state of health, as it has been defined by the WHO (World Health Organization): not merely the absence of disease and infirmity, but a state of physical, mental and social wellbeing. The growing awareness of the social dimension of experiencing art and participation in culture, generated artistic proposals in illegitimacy areas and they became vehicles for the interpretation and transformation of the human and social reality. Interactions thus generated have opened different paths and contexts of meaning capable of building a new paradigm of reality’s knowledge. Artistic and scientific exploration have contributed to emergence of a culture of health that attempts to overcome the diversification and geographic, demographic and social stratifications of wealth. The Culture conceived in this way is a guide of public and private decision-making process, in which everyone has the opportunity to make choices towards healthier lifestyles. This metaphorical reorientation of the categories of thought and ideologies has placed art and culture as a point of interest, in an international context, of different systems: economic, political, educational, technological. In the Italian, cultural system seems to have fully transposed this paradigm shift, becoming an active subject. In a world in which the arts are increasingly forced to justify their shrinking funding, against public accusations of elitism, it is comforting to take note of insights and planning actions that museums and various cultural institutions are producing as a coherent response of “civilization” to an attentive reading of needs. But is this a load of “goodness” that culture (business and institutions) can and must bear alone? “I sit on a man’s back, choking him, forcing him to take me. Meanwhile, I try to convince myself and others that are filled with compassion for him and manifest a desire to improve his lot by all possible means. Except getting out of his back, “(Leo Tolstoy” What to do? “, 1979). Imperatives, however declined in the conditional, claim a systemic vision in which attention is paid to the context and dynamics that take place there, to the processes and not just to the results, and where awareness matures of how to describe, build, learn and use their reference metaphors, which is important to act reduced complexity and to draw maps that simply do not identify with the territory, but from which it is easy to perceive differences, changes and relationships. The “place” of culture, thus redefined, recognizes their principle of individuation to relational primarily coordinates and it becomes connection space and dialogue: dialogue as “oxytocin” in response to trauma, social and cultural fractures, fear; viewing and listening multiplicity as a medium to start that virtuous circle of participation, individual and collective transformation tool (L’asino d’oro, Apuleio) in direction of a person’s culture. However, while this awareness generate enthusiasm and attempts to prospective looks, Stiglitz (2010) informs us that global per capita GDP increased but it does not reflect an increase in the collective well-being and he highlights the strong existing social inequalities. “Which is the value of a civilization if the person who lives there gets sick because of it?” (Hillman, 1994). Paraphrasing the Nobel economics prize which proposes an index that takes account of social welfare, the neurobiologist Maffei (2016), almost provocatively suggests the cultural GDP as “more democratic and objective representation the value of the citizen”. If culture, understood as “accumulation of knowledge and innovations resulting from the sum of individual contributions transmitted through generations and disseminated to our social group, which influences and continually changes our lives” (Cavalli Sforza, 2010), must function as homeostatic principle, or allostatic as we shall explain further, which puts balance in economic and power disparities, then it will certainly be useful to conduct a careful analysis of the culture that highlights the peculiar traits and the state, taking as observation instrument epistemological lens of neurobiological sciences. The plasticity of the brain and its ability to adapt prompted extensive surveys on cultural and biology interactions and it identified, in fields as diverse, similarities in the mechanisms and processes that develop adaptation to the environment. In particular the studies on DNA methylation enable us to state that “the culture depends on the epigenetic plasticity of neural networks under development. Paradoxically, we can say that culture is primarily a biological trace, or rather neurobiological. There is thus no conflict between nature and culture. In contrast, (…) the genetic envelope includes epigenetic response to the environment and thus the genesis of culture “(Changeux, 2013). The widespread recognition of the evolutionary cognition basis and co-evolution of the brain and culture makes it clear how the cultural and neural processes are intertwined, and it allows us to consider the brain the organ of the culture and the “place” of its history (ST Fiske , 2010; Lewkowicz, 2011). Culture is therefore a necessity of biology and our current understanding of epigenetic mechanisms places in strong emphasis the reciprocity of this need: the human being “is neurally prepared to art, ethics, social life, language … that in turn they renew this provision “(Changeux, 2013). Nature and culture, one of the other epigenesis. This awareness has recently driven scholars to consider the role that culture plays in the development and brain functioning, opening a new field of investigation of cultural neuroscience. Overall, studies have documented the ways in which neural mechanisms underlying behavioral perceptual and cognitive processes vary between major cultural groups, exploring more fully cultural elements of individualism and collectivism . These provisions intersect all those protective factors (biological, genetic, psychological, social, environmental) that facilitate and enhance resilience, affecting not only the way we conduct ourselves, to see and interpret the world, but also leading to fundamental changes (epigenetic) in structure and in brain function. (Fiske 2010; Rule et al. 2011, 2013, 2014; Bharucha 2009; Salvato, 2014; Ma-Kellams, 2012; Denkhaus, 2012; Freeman, 2009; Abraham, 2013; Atkins, 2016; Bao, 2016; Delfino, 2015 ; Hyde, 2014; Park, 2010; Schroeder, 2016; Sirigu, 2016; Tan, 2016). The most significant acquisitions for the purposes of our discussion emerge in social domain. The literature has provided convincing evidence of cultural variations in brain processes related to self-perception that reflects the core values of culture as the independence and interdependence: whereas Western assign greater emphasis on personal self and apply the pattern of independence also to social perception basing their emotional life more about personal goals, needs and desires, unlike the Orientals use an interpersonal pattern of self motivated more by social objective and concerns (S. Kitayama et J. Park, 2010; Liddell, 2016 ; Berlingeri, 2016; Chuanpeng, 2014; Immordino-Yang, 2014). Neural mechanisms underlying these cultural rules altogether involve the prefrontal cortex, highlighting the universality and together cultural individuality of social character of man . The prefrontal cortex is the part of the brain more recently evolved. What has allowed, from an evolutionary point of view, its development so disproportionate in humans compared to other species? Whitaker and Dunbar (2016) have proposed that during the evolution the complex decisions to help or not the other have led to broader measures of human brain. In other words, the evolution seems to have rewarded those advantageous aid strategies both for the group as for themselves. Neurons at axon along are PFCs characteristic, which work as a kind of curiosity devices and they allow an extraordinary behavioral flexibility in interaction with the environment. Device that assesses, plans, decides, explores in a continuous dialogue with external and internal environment. This biological availability enables the human being to react to unusual items such as cultural artifacts and maximizes the experience expanding its expressive potential and action. It seems that just cooperative nature of man and the ability of common social representations, which find their antecedent in a normative ethics and morality, free brain activity from fixed and stereotyped mechanisms and allow the culture to emerge and diversify. If what has been said until now, puts strong emphasis on the universality of human character, it is certainly required an diachronic analysis of neuroscience emersions, because it is unthinkable to propose a notion of culture as a stable entity, purged of its temporal dimension, as if to define a ” culture itself. ” And the epigenetic studies will reinforce the need. While Between analyzes reflect Westerners and Easterners different epistemological orientations that could be traced to the ancient Greek and Chinese philosophies , Within analyzes illustrate variations in cognitive guidelines also within cultures that share a single ancient tradition, indicating with this a shifting of cognitive models through time (RI Iliev et B. Ojalehto, 2015). Cultural nature of man must therefore be investigated by the natural one and vice versa, investigation who assumes epigenetic variability as the embodiment in the form of neuronal track of historic facts. Man can therefore be described in terms neuro cultural and culture may well be called a neurohistoric tract (D. Smail, 2008; E. Russell, 2012). In spite shared the opinion that modern, globalized and hyper-connected world is interdependent, the acquisitions of cultural neuroscience, which attempt to map the historical trends of cognitive styles, highlight the significant changes over the last century of some significant variables for Westerners: if there is an increase of self-esteem, it does not correspond, however, to a conformity to its peer group which instead decreased over time, and paradoxically, there was an increased need for social approval and trust; we are witnessing significant increases in depression and other psychopathology and decreased empathy and capacity of change of perspective; also it observed a steady decline in the language of words related to the duties, obligations and membership, accompanied by an increase of the words related to individualism, choice, and materialistic values. Curiously also for certain non-Western realities we are witnessing a system of meanings, beliefs and attributions closer to Western-style powers, probably caused by sharp socio-economic changes (R.I. Iliev et B. Ojalehto, 2015). Technology, globalization and altered lifestyles have undergone modern man to important and complex challenges of adaptation. From a biological point of view this adaptation is “neuroimmunemodulated”, that is regulated by a complex cascade of biochemical events (neuroendocrine, immune-inflammatory, metabolic) that interact with each other in a nonlinear way and they involve complex in the great physiological systems of the report of ‘individual.Bruce McEwen has deepened the concept of allostasis, initially introduced by Sterling and Eyer (1988), which refers to the process by which an organism maintains physiological stability, chancing the parameters of its internal environment adaptively to the environmental demands. In contrast to the notion of homeostasis that involves a previous restore equilibrium, the allostasis defines health as a state of reactivity and predictive change in which the entire body is adapted to the context establishing a new balance. As Heraclitus wrote, “the only constant is changing.” Moreover, even Plato defined the health and disease of the body as the result of a distribution of power between the parts of the body according to nature or against nature, by identifying the organism desease in stasis and in analogy to it that of the polis (Cambiano, 2016). And as Plato speaks of polis “phlegmaìnousa”, becoming an organism sick, a swollen body of “moods” and then inflamed (ibid), McEwen speaks of allostatic load (and overload), meaning with it attrition that the body experiences as a result of repeated allostatic responses, which leads to the inability to re-establish a state of equilibrium. The brain, the central organ of allostatic mechanisms, it is also the target, undergoing changes in its architecture: gene expression and epigenetic regulation reveal a dynamic and evolving brain. It determines behavioral and physiological responses that can contribute or improve systemic dysregulation, and thus play a key role in exacerbate or counteract allostatic load / overload. Epigenetic path of allostatic load involves different brain structures: the hippocampus, amygdala and in particular prefrontal cortex  . The cost of adaptation could then lead to stasis (Eisenberger, 2016; Filiano, 2016; Guss, 2014; Hansel, 2008; Inagaki, 2012; Lamichane, 2015; Muskatel, 2016; O’Connor, 2009). Thus it appears that in excessive “exercise” of natural tendency to self-preservation, it could compromise the possibility, permitted by the architecture of our brain, that human decision is rooted in the culture. “It ‘s likely that some of the simplest forms of behavior required to make that decision, as reciprocal altruism and mutual criticism, do not expect more than to be awakened from social experience.” Unfortunately, “many negative social emotions, together to their exploitation by modern cultures, make the difficult human decision to implement and perfect”(Damasio, 2003). 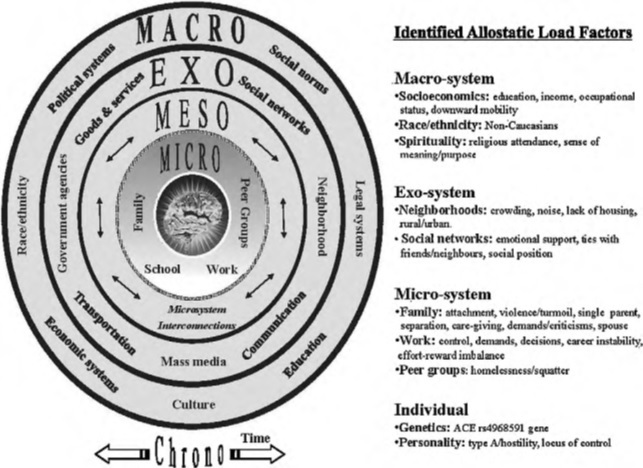 Consistent with Damasio, McEwen puts the construct of allostatic load in a network of socioecological antecedents systems that identify in social inequalities the main predisposing factors (McEwen, 2000, 2010, 2015, 2016; Juster, 2016; Robertson, 2015; Sarnyai, 2016; Upchurch, 2015, 2015; Wickrama, 2016; Yu, 2014). The interdependence between biological and cultural processes allows us now an extension speculative defining allostatic cultural load as the cost of adapting of the culture to a hypercomplex society, where consumption undermines the experience and speed of interactions saturated reflection space and the dialectic of ideas. And ‘wear of that “curiosity” device, an interface between the body and the external environment, the experience modulator and abstracting summary of emotions perceptions and relations with the vitality that surrounds us, that unmasks instead a critical maturity of reason , a faded phronesis, in the sense that Aristotle attributed to its: ability to assess, approve and direct the choice good. Biological and cultural allostatic load are perpetuated into each other fixing human progress within a framework of rigidity of thought and action. To prevent stasis requires a high-level human effort, a titanic struggle against the tyrants of habit and automatism, the stereotype and prejudice. If the neurobiological slope this inhibitory action is top-down and locate art and cultural participation the best tool of access to positive health and eudaimonia (happiness)  , from a cultural standpoint it becomes the reverb through a bottom-up mechanism . Art and culture so work as a allostatic principle that not only creates new social balances, but it determines the conditions for the development of those exceptional, intuitive and divergent intelligence, able to see so “disrespectful” something completely new in the world, making possible the continuity of life. “If obedience is the result of the instinct of the masses, the revolt is that of their thinking” (Balzac, 1838). It comes against the evidence, and at the same time the urgent need, which enable this principle can not only be action of cultural system but it is an imperative also shared and supported by educational political economic systems: the allostasis can only result from a network of meanings that connect (Bateson). Foregoing has certainly not the presume to bestow miraculous answers or prescriptions, but to make a contribution to increase awareness. Ours is a slow reflection that leads us to recover the value of our historical memory and to rediscover the need of continuity with the past. Friendship (philia) and harmony (homonoia), pursued through constant and continuous work of education (paideia), seem to be still “the golden mean” to create an authentic, liable and harmonic community, in which all are partakers of each other welfare of the community. (Koenig-Archibugi, 2012; Archibugi, 2005; Bernacer, 2014). “In old age beautiful public life was the ethos of all, beauty (as) immediate unity of the universal and individual, a work of art, in which no part is separated from the whole” (Hegel) . : While Western societies reinforce dominance behavior, independence and assertiveness, the eastern encourage subordination, to ‘adherence to the group and cooperation. This reflects the greater activation of regions of mesolimbic reward in two groups in response to images of dominance vs. submission. In the domain of perception Orientals highlight the use of holistic strategies, perceiving objects, people and the environment as mutually interdependent, while Westerners apply more analytical or context-independent perceptual strategies. Medial prefrontal cortex (ventral mPFC), involved in the processes of self-representation, is activated differently for two cultural groups : where in the Western is involved exclusively in thoughts of the self, in the East it is also implicated in the thoughts of others, implying for Eastern the concept of Other as part of the Self. Dorsal portion of mPFC is enabled in both groups in response to thoughts of others’ beliefs, diverging instead on the implication of other regions: the Eastern exhibit a more consistent activation of orbital-frontal regions (OFC, engaged in broader assessment processes) . And ‘interesting to note that when people think about themselves from others’ point of view, the activation of ventral mPFC disappears, receiving prominent activation of dorsal portion of PFC (D’Argembeau et al., 2007). The activation of bilateral ventral PFC has emerged in both groups in inferring other people’s mental states (theory of mind), suggesting that these areas are important for universal understanding of intentionality. Just as contemporary oriental people, ancient Chinese philosophers were interested in the continuity, changes, transformations and dependence between objects, while the Greek philosophers were interested in universal truths, formal rules, objects and discrete entities. In addition, ancient Chinese were motivated to technological advances driven by pragmatic goals, while the Greeks evaluated intellectual effort for himself and were less concerned about practical applications of knowledge (R.I. Iliev et B. Ojalehto, 2015). These different cognitive styles, and consequently social, of two cultural groups, reflect distinct roles suggested for the subdivisions of the medial PFC: while ventral portion seems to play a more important role in initial adaptation to the environment by enabling emotional behavior, dorsal areas come into play later when braking the infralimbic area activities involved in emotional states characterizing the so-called Western rationalism (for exposure brevity let’s just mention the hemispheric specialization of PFCm in emotional reactivity control). The hyperactivity of the amygdala is directly related to anxiety and depressive disorders. This increased reactivity to daily environment (the reaction of fear does not turn off even in a safe environment) contributes to allostatic load that secondarily leads to disease. Dendritic loss of hippocampal neurons (brain area involved in memory processes) is involved in several diseases, such as cognitive deficits and mood. Dendritic atrophy of prefrontal neurons and reduced neurogenesis determine overall a poor cognitive flexibility and a reduced functional connectivity that leads to a support the hyperactivity of the amygdala, being compromised tonic-inhibitory action characteristic of the PFC. Also they are impaired social skills, the ability to cooperate and expression of social emotions. Stiglitz J.E. et al., La misura sbagliata delle nostre vite. Perché il PIL non basta più per valutare benessere e progresso sociale. Milano, Etas, 2010.